Shopping day. I’m supposed to be saving for a new phone with a better camera, so I can blog better. 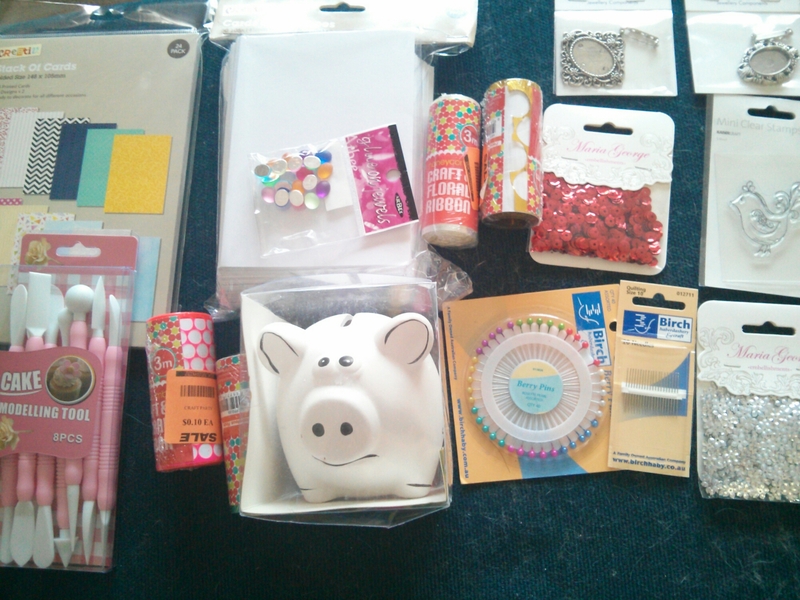 I still spent a bit on on craft supplies. Today I found card bases, in a paper pad style layout, but they are scored and patterned already. There’s 24 in a pack, called stack of cards, by cre8tiv. I got some white card bases because I was running out as well as some cheap card stock. I picked up some sequins to make more embellishments. There was rolls of honeycomb ribbon for really cheap, so I got four of them. That is the ribbon that looks like sequins have been punched out of. Since getting my sewing machine, I couldn’t find my dressmaking pins, so I got a small pack, because knowing my luck, I’ll find all the others now. I got some small sewing needles while I was there. I’ve been having fun covering kids money banks with all types of glittery things, so I got another one, which I’ll cover in blue sequins that I found in my stash. In the cake section we saw tools that would work well for clay and embossing paper, but they were so expensive. We ended up finding the exact same thing in another shop for less than a tenth of the price. I found some bezels, which I had been looking for, which would be nice to decorate and fill with resin. I can never resist craft supplies. Don’t shop online all the time! So much fun doing the” touchy feely” at the craft shop!